Blue vanilla: vanilla cake ball mixed with creamy vanilla frosting, coated in dark chocolate and sprinkled with blue sugar. Pink vanilla: vanilla cake ball mixed with creamy vanilla frosting, coated in dark chocolate and sprinkled with blue sugar. Chocolate: chocolate cake ball mixed with creamy chocolate frosting, coated in dark chocolate and chocolate chips. Our cake pops are made without the top 10 food allergens, are gluten free and completely vegan. 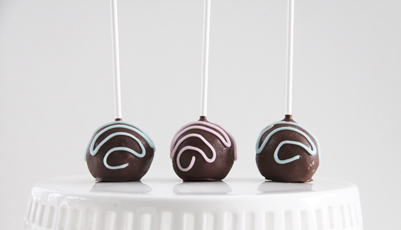 Simply a cake ball on a stick, easy and fun to eat. Become addicted!